A practical and useful crusher. 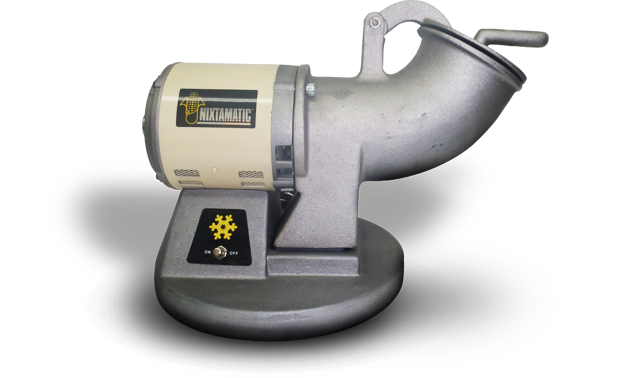 With the NIXTAMATIC ICE CRUSHER you will save time, money and inconveniences. You can crush any quantity in a minimum space and with the hygiene required. 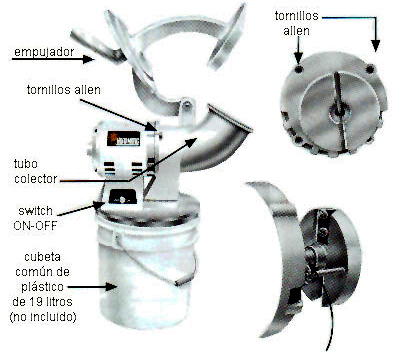 Furthermore it allows you to regulate the grain size just switching the blades position. To crush the ice, place the crusher over a plastic pail, plug it to a near 127 CVT connector and press the off-on buttom. Place the ice inside the trap tube and push it gently with the pushing handle. *NOTE: Unplug the grater before proceeding. 1.- In order to change the blades position, unscrew the allen screws that support the trap tube and remove it. 2.- Unscrew the allen screws that support the blades. 3.- Adjust the blades in the right position taking care of them to be parallel to the flywheel surface. 4.- Tight up the screws to keep them in the new position. 5.- Place the new trap tube and tight up the allen screws. IMPORTANTE: Al terminar la labor, limpie las piezas cuidadosamente, séquelas muy bien antes de guardarlas, para limpiar el motor use un trapo húmedo solamente. In case of having to disamble the blade flywheel, place a hand ice crusher into the spire hole and turn the flywheel on the counterclockwise direction.